In ONLY 4 Weeks,Can I Help You Attract 10 To 30 High Paying Clients/Customers Every Single Month Who Will Happily Pay You Premium Fees WITHOUT Resistance, No Matter What You Sell...Guaranteed? I’m very excited today because it’s my birthday. I recently surveyed some business founders and entrepreneurs and I found out that one of the major headaches they have is GROWTH. Getting customers who will pay premium and even stay with them for a long time is their biggest 'pain point'. Let me show you something that may shock you. Yes, the makers of Mac, Iphone and the others. Well, I believe you do. Let me share what they made from one of their products. Can you see the jump in revenue from 2009? In 2010, they made a decision to work with only premium clients. It doesn't matter what you sell or what industry you operate in, you can definitely get a steady flow of premium clients,I'll tell you more shortly. 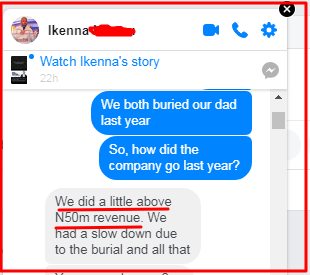 Take a look at this my clients below, his company did over 50 million naira last year and they are on a path to 3X that this year despite the challenges in the economy. I focused on helping his company attract a steady flow premium clients and also developed a system that will make premium clients stay with him for atleast 24months,minimum. This guy paid through his nose and he even waited on the queue for 3months before i agreed to work with him. He says the results are worth the wait and he would do it over and over again. Most of my clients get result way better than this but let's keep going. One of my companies is experiencing one of the craziest growth in history, the company is on the path to 9figures in OCT,2020, a company that stated less than 3years ago. So, how can you make this happened for your own company? It's my birthday and I'm doing something EXTREMELY crazy. I want to PERSONALLY work with you in your company to help you attract premium clients who will happily pay you high fees. 4 Weeks DONE WITH YOU Coaching Program To Help You Attract 10 to 30 High Paying Clients Every Single Month Who Will Pay You Premium Fees Without Resistance. In 4 weeks, I will be working directly with you, one on one. We will create your irresistible offer,setup your systems for attracting clients, setup your ads,etc. This is a brand new program and to celebrate my birthday, I'm making it even crazier by offering amazing bonuses. #1: Facebook Ads creation and launching, I will personally help you create and launch at least 1 ad on Facebook. Imagine me helping you write the copy and even launching it. Companies pay us as much as $2,000 monthly to manage their ads. #2: Premium Closer Closer Script-This is the exact script my team constantly use to close high paying clients. It's a proven script that we have been using for 5years. I didnt want to add this bonus because it's one of our 'top most killer' secrets but i decided to do it anyway. Listen, this is 'PURE GOLD'. #3: How to deal with objection before the arise script. Most people show you how to deal with objections, i show you how to deal with them BEFORE they arise. It is good to prescribe drugs for a sick person but it is way better to prevent it from happening. My secret playbook for attracting HEAVYWEIGHT strategic partners as my clients and even partners who will sing about my products and service,It's pure secret. I dont just mean 'mean men', I mean 'heavy weight' with deep pocket. #5: Watch Me close a high paying clients on the phone live and in less than 30 minutes and model my formula. #6: Thrivetheme tool- this is the tool that will help you create a 24/7 'machine' that will consistently attract premium clients at clockwork. I mean even while you are asleep. #7: Email System-Instead of paying $348 (N124,200) per year, I will show you the one that you can use for free and it's even most effective like others. Yes, you will have a direct email to reach me AFTER the program for 2weeks and if need me, I'll also put a surprise call through to you and I'll bear the cost of the call. Ok, lets sum up the total value of this crazy offer. You know, my clients happily pay me between N500,000 and solid 8figures to work with them. So, it won't be out of place if you pay N1,375,880 since I'm 100% sure you're going to get result. Infact, you might even get it back with ONLY 1 good premium client and it's even possible that you'll before the end of the program. Now, If I say pay N700,000, it wont be too much either because this program will transform your company or I'll personally work with you for FREE for 2months as your 'marketing head'. I'm NOT going to ask for anything near that because it's my birthday. This program is a practical program,you will be working directly with me and our goal is simply to attract premium clients to your business. Most people teach only theory, we will be doing it together, me helping you to get the result you seek. So, Why I'm I Keeping It So Cheap? First and foremost, no time to waste, we are starting class next week. This program is going to be for only 5 people at most,nothing more. 1: It's my birthday and i think the best thing i can give you is something that will totally transform your business in the next few months. If i invite you for a party, what happens after the party? 2: This is a brand new program, i actually plan to sell it for N450,000 in March of 2020 when I open the widow again. So, when you get into the program, I will use your testimonies to tell the world about it. So, can you see why your results are very important to me? Sadly, this offer is only for today. As a matter of fact, I'll be bringing down this page at midnight.